I fell into media most certainly by accident. It all started right after I graduated from the Southwest College of Naturopathic Medicine in early 2001. I had moved back to Los Angeles to hang my shingle and start helping people. Soon after that, I received a call from a television producer, looking for a “natural doctor” for a show they were developing on the Discovery Health Network called “For Women Only.” I identified myself as such and they asked me to submit something of myself on tape. I had just delivered our commencement speech to my graduating class, which was video recorded on VHS­—yes VHS! I packaged up this big tape and sent it away. Weeks later, I was called by an enthusiastic producer telling me I was on a “short list” (I had no idea what that meant, but played along) and was to come into the studio, read off a teleprompter, and do a voice over with the other proposed co-host. What an unforgettable experience that was…I bombed—in a big way! Why? I had no experience, no direction, and frankly, no clue. Knowing that this platform was such a valuable and effective way to spread the word about naturopathic medicine and a more comprehensive way to view someone’s health, I went and got some training. I have been through several media training sessions in my career, which thankfully has led to many successful media tours, as well a talk show. 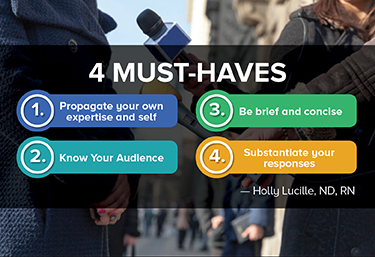 Today I am passing onto you a few of these media must-haves to accentuate your practice and build your own brand. If you have a media opportunity—whether it be print, camera, or radio— make sure your expertise is visible. Unless you have pre-negotiated otherwise, be sure your name, title, and practice are displayed and accurate. Providing a biography upfront can be helpful in making sure this information is showcased properly. Always envision the interview process as a promotional opportunity, for both your practice and integrative medicine, not merely a “Q and A” session. Make sure to find out the basic gist of the interview and the story, then prepare, rehearse, and memorize your key messages. And lastly, if you can, give the reporter a “heads up” on interesting points he/she may want to ask you about. Make sure you do background work to find out the intended audience of your media engagement. If you will be speaking to those without a medical background, it can be easy to riff off a bunch of things in an interview that will leave viewers or listeners going, “HUH?” It is fine to utter a medical term, but follow it up straight away with a super-understandable explanation or analogy. When being interviewed, your length of answer should be approximately 10 seconds long, tops. Media situations are quick and fueled by sound bites. Speak in simple, complete sentences and don’t overload the reporter. If you have the opportunity to understand what questions you will be asked, you can prepare. One trick that has helped me is actually thinking to myself as I am being asked a question, “My answer will be brief and concise, slow and deliberate.” This self-thinking exercise actually helps me breathe and remain calm so I can deliver an eloquent answer. The key is relaxing and not being afraid. Just being yourself is helpful in this situation. When giving information, back yourself up with practical examples from your clinic and make sure to arm yourself with references and statistics. If you don’t have an answer for a particular question, say it and then promise to get the information to the reporter ASAP. Then, follow through. Personal opinion responses can set you up for criticism and allow for interpretation and controversy. Dr Holly Lucilleis a licensed naturopathic doctor, educator, natural products consultant, and television and radio host. She believes in the science, art, and mystery of healing and has a heartfelt passion for the individual wellness of all people. Built on this foundational belief, she uses the magnificence of multiple media platforms to truly make a difference and empower people to heal. Dr Lucille’s private practice in Los Angeles, Healing from Within Healthcare, focuses on comprehensive naturopathic medicine and individualized care.